The PCT-200 Process Control and Instrumentation unit is a fully integrated self-contained floor standing process control system, representative of industrial process control systems used in chemical, oil, food, water and other process industries. The PCT-200 is fitted with state-of-the-art intelligent process instruments and actuators networked via PROFIBUS PA and DP to communicate with a Programmable Logic Controller. 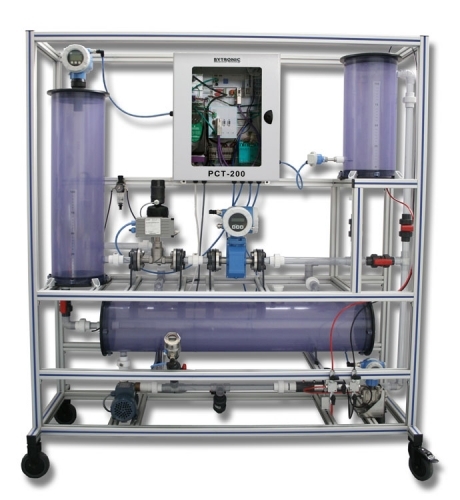 The PCT-200 can be configured to implement a number of different control strategies for flow and level control using cascade, feed-forward and multi-variable strategies and also separate level alarms, and process and device temperature monitoring. 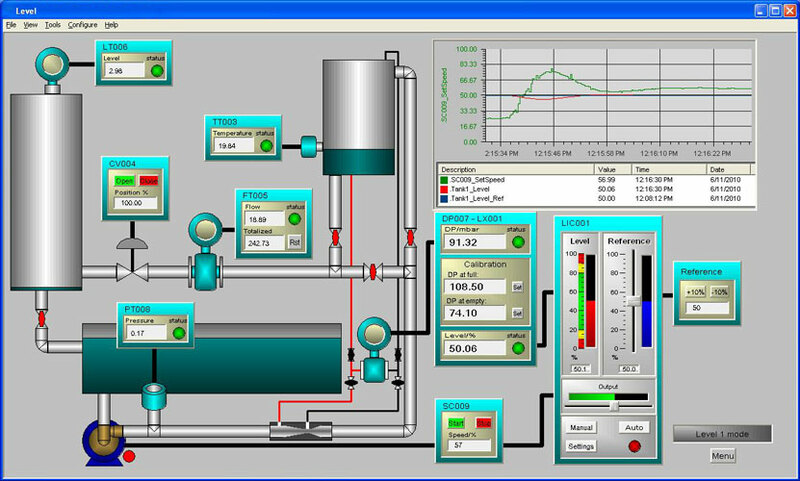 Control of the system is through SCADA (Supervisory Control and Data Acquisition) software using a PC with an Ethernet connection. Water is pumped around the system using a speed-controlled three-phase pump, controlled by a variable frequency inverter with integrated Profibus DP, from a reservoir tank to two process tanks. The pump outflow goes through a venturi-tube providing flow measurement using a differential pressure transmitter. A pressure transmitter is used to measure the discharge pressure from the pump and can be used for experiments on the pump characteristics. Manual ball valves can be set to direct the flow around the system. The level in process tank one, can be measured using the differential pressure transmitter, and in process tank two, using the ultrasonic level transmitter. A temperature transmitter is fitted in process tank one for monitoring of the water temperature. The outlet of process tank one and from the reservoir tank goes to process tank two through an electromagnetic flow meter and then to a modulating control valve fitted with a pneumatic positioner. The control valve can be used in conjunction with the flow transmitter for flow control, or in conjunction with the ultrasonic level transmitter for level control in process tank two. A cascade control system can also be implemented by feeding the level controller output as a set-point to the flow controller. All instrumentation and actuators use PROFIBUS connectivity. A DP/PA coupler provides a transparent gateway from DP to PA. The PLC incorporates a PROFIBUS DP master which controls cyclic communication with all the field devices. 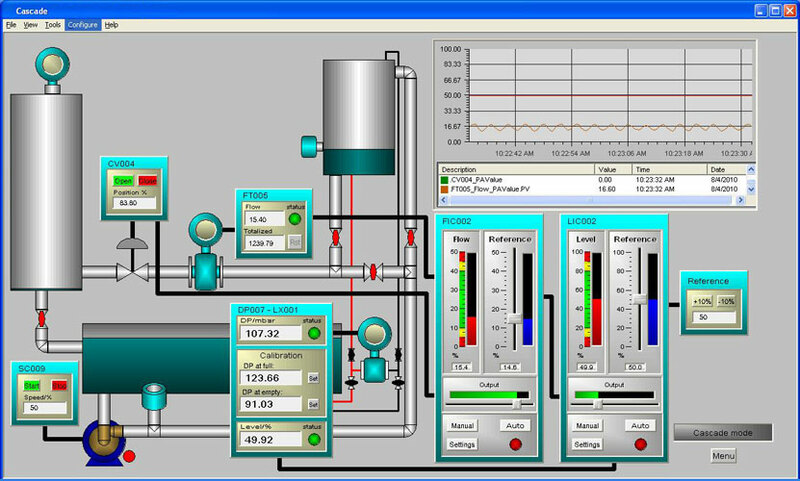 The PLC has an Ethernet interface which enables networking to the PC with the SCADA software.